CK2 is one of the serine threonine kinases known to be essential for basic cell viability and survival. Until recently, genetic, biochemical, and cell biological studies have indicated the involvement of this enzyme in the control of cell proliferation and in signal transduction. 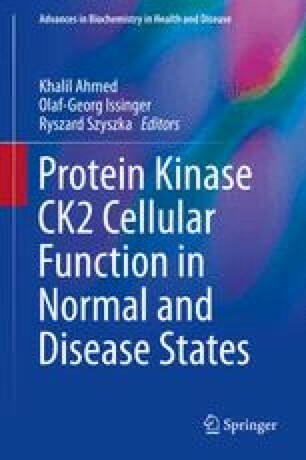 It has been reported that more than 300 proteins have been identified as CK2 substrates in cells; however, the clarification of the functional relationship between those substrates and CK2 in the aspect of cell proliferation and survival is still required. The identification of the cellular factors involved in CK2 function is important to delineate its molecular mechanism in the cells. We previously demonstrated a significant increase in CK2 activity by growth factor stimulation of quiescent cells and identified eIF5 in the CK2 complex as being a downstream molecule. Also, we described the cell cycle-dependent association of CK2 with an endogenous tumor suppressor adenomatous polyposis coli (APC) protein, which was further investigated to uncover the negative regulation of CK2 activity by the APC-C terminal domain that is lost in more than 60 % of FAP-derived cancer cells. These results established the importance of kinase activity that seems to be non-constitutively active and controlled by unknown cellular mechanisms for properly regulating cell proliferation. We therefore examined the CK2 protein complex in the nucleus in distinct phases of cell proliferation by employing synchronized cells. Cell lysates were made after the stimulation with FBS, and nuclear fractions were extracted and immunoprecipitated with anti-CK2 polyclonal antibodies. Using two-dimensional gel electrophoresis followed by mass spectrometry analysis, we identified 22 proteins, including hnRNP, histone-binding proteins, and lamin-B, which were localized in the nuclear fraction preferentially associated with CK2 in the early G1 phase. In further studies, using nuclear CK2 immunoprecipitates followed by nanoLC mass spectrometry analysis, we identified 140 proteins as CK2-interacting proteins in the nucleus. Intriguingly, more than 20 % of these proteins were constituted by DNA-binding and RNA-binding proteins, suggesting the involvement of CK2 function as a dynamic regulator for gene function associated with cell cycle progression. Our approach can be extended to other cell states and cellular compartments and provide the broad biochemical framework for understanding the role of the kinase. The authors acknowledge Drs. Dongxia Li and Tamiko Sueoka for discussions on the manuscript, Ms Junko Yamaki for her technical assistance, and Pete McCann, Roy Cameron, and Naoko Shiota for their critical reading on the manuscript. This work was supported by grants #23570170 from the Ministry of Education, Science, Sports, and Culture of Japan, Research Seeds Quest Program from the Japan Science and Technology Agency, and the Grant for Joint Research Project of the Institute of Medical Science, the University of Tokyo.